Papaya has root, stem, leaf, flower, fruit and seed. Papaya is an excellent source of vitamin A, C, E and dietary fibre and is also rich in antioxidants – the carotenoids and flavonoids. Papaya leaves are native to Central and South America. They became naturalized throughout several countries of Africa, the Caribbean Islands, and Florida. Traditional healers from the tribe in Zimbabwe have brewed the leaves into the tea to help with digestion issues for hundreds of years. Papaya Leaves are the leaves at the top of the plant. The leaves are composed of the circular spiral tree. They have a leaf-shaped sheet. The upper surface of leaves is dark green and lower surface is light green. Let’s see some of the amazing benefits of papaya leaf juice here. One study found that the leaves of papaya plant are rich in several minerals may balance the mineral deficiency caused by the virus and strengthen the immune cells against it. The juice of papaya leaves is an effective herbal therapy for curing the dengue fever. Papaya leaves contain important nutrients such as vitamins A, B1, C and E, calories, protein, carbohydrates, calcium, phosphorus, iron and water. Papaya leaf juice has an important enzyme called papain that aids in digestion by breaking down the proteins naturally. Papaya fruit is great for your skin and is incorporated in several face packs and skin care products to give you a healthy and glowing skin. 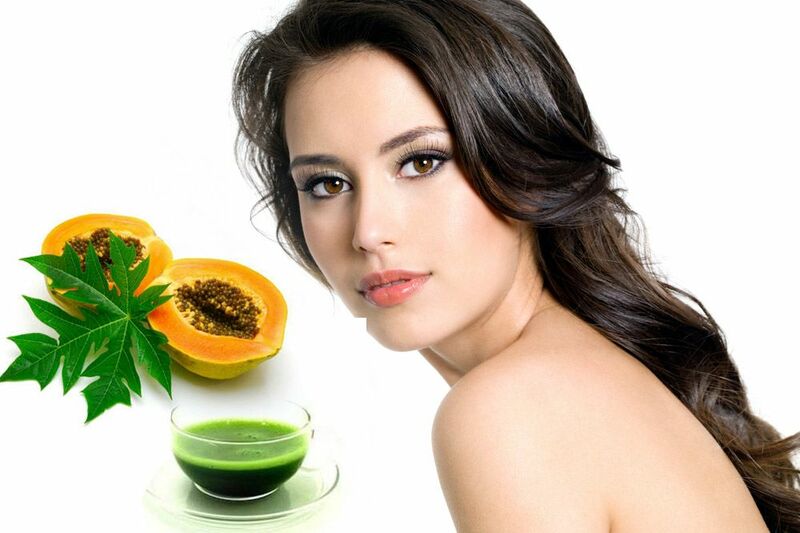 Papaya leaf juice acts as a skin cleansing agent. This can be attributed to the presence of karpain compounds that inhibit microorganisms and other toxins, thus giving you a clear skin and providing protection against skin problems like pimples, freckles and blemishes. Juice of papaya leaves is effective in treating eczema. You can apply it to your affected areas after scrubbing. Fresh papaya leaf juice helps in healing open wounds and sores. As this leaves are rich in vitamins, minerals and enzymes, papaya leaf extract is often used in a number of hair care formulations like shampoos and conditioners to promote hair growth, strengthen the hair shaft and ward off problems like balding, thinning, dandruff etc. When used as a conditioner along with other ingredients like coconut milk and honey, it adds shine to dull, lifeless hair and softens coarse and unruly hair. Papaya leaf extract is particularly used as an ingredient in anti-dandruff shampoos meant to control flakes and prevent dandruff. Due to the presence of karpain compounds, it is effective in removing dirt and oil, as well as chemical build up from hair without any side effects.